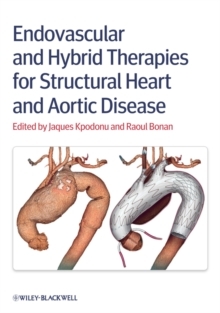 Saves Time and Effort Find everything you need on the most advanced treatments for aortic and structural heart disease in one easy-to-reference book - Procedure videos included Percutaneous valve repair and replacement is one of the hottest topics in interventional cardiology. Substantial research has underscored the efficacy of emergent minimally-invasive procedures, and as a result percutaneous techniques are rapidly displacing surgical options as the treatment of choice for patients with aortic and structural heart disease. Now, for the first time, you can get everything you need to add new techniques to your repertoire or achieve true mastery of procedures you have already begun to practice in one convenient book. Master Leading-Edge Therapies Practical, Step-by-Step Guide to the Latest Endovascular and Hybrid Techniques Edited by two of the most experienced practitioners in the field, Endovascular and Hybrid Therapies for Structural Heart and Aortic Disease covers everything interventionalists, radiologists, cardiac sugeons, and vascular surgeons need to know to master leading-edge therapies, including: * Equipment selection and preparation * Expert tips and tricks on individual therapies * Use of advanced imaging modalities like CT and real-time MRI * Optimal management of complications and proper patient follow-up * A review of the pertinent anatomy, information on patient evaluation * Complex procedures and possible complications * Essential hot topics: Hybrid Endovascular Aortic Arch Surgery, Technique of Thoracic Endografting for Thoracic Aneurysm using the Approved Gore TAG Device, Endovascular Robotics for Complex Aortic Intervention, and Transcatheter Closure of Mitral and Aortic Paravalvular Leaks, and more! Plus, each chapter is fully illustrated in color, and a companion website includes video clips of procedures covered in the text. Order your copy today!